Industrial Pipeline Y-strainers have the ability to eliminate unwanted debris from gas and steam lines through its wire straining equipment. 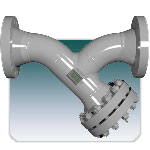 It is crucial that y-strainers are reliable because they are typically used in pipelines in order to protect control valves, meters, pumps and other processing equipment. Y-strainers are chemically resistant to harsh industrial chemicals, see more on FRP strainers. Since 1952, Marshall J Brown can guarantee that our y-strainers are of the utmost quality and will perform to your standards, if not exceed them. Not to mention, we are constantly striving to provide customer satisfaction and superior products. We also offer a variety of other industrial strainers.